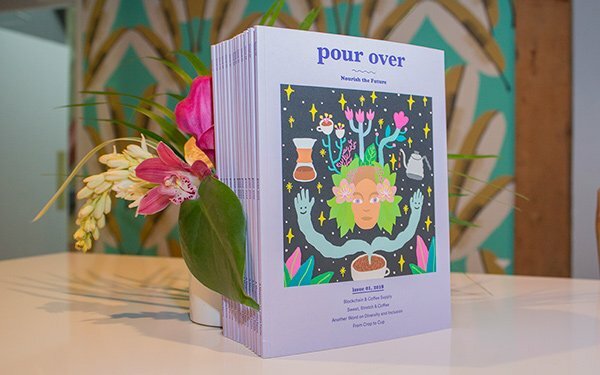 Nut-beverage and coffee company Califia Farms has launched its first branded print magazine, called Pour Over. The magazine focuses on coffee culture and a plant-based lifestyle, focusing on the companies and individuals developing sustainable food systems. “In the pages of Pour Over, readers will discover stories that inspire each of us to create a more positive model on our food system by valuing the three tenets of personal health: farmer livelihood and environmental sustainability,” stated Greg Steltenpohl, CEO of Califia Farms. Switching to a plant-based diet has become more about the effect it has on the environment, April Siler, SVP of marketing, told Publishers Daily, than about animal welfare. Coffee is one of the largest agriculturally traded, plant-based products in the world, and its production affects the environment, she said. The Los-Angeles based Califia Farms is “embedded in coffee culture,” Siler said. The company's Barista Blend almond milk is popular at coffee shops, and Califia Farms has expanded into cold brew coffee products, becoming one of the top coffee brands at Whole Food Markets. “We wanted to create a print magazine that helped tell our story about why we got into the coffee industry and how we go about that, in a fun and creative way,” Siler said. The goal for the magazine is to get people to pick up a copy and “understand more about Califia Farms and its mission,” she added. Articles from contributors range from how blockchain -- the same technology behind cryptocurrency -- could benefit farmers and change the coffee supply chain, and the importance of diversity and inclusion in the coffee industry. Another story looks at how coffee waste can be turned into new materials for activewear. A photo-essay demonstrates how an almond goes from growing on a farm to becoming part of Califia Farms’ Barista Blend almond milk used in coffee shops. Parts of the magazine are available online, but a few features are exclusive to the print edition. The issue includes a collection of fun stickers, for example, as well as a pull-out map of the ten most memorable film scenes set in Hollywood diners and coffeehouses, called the “Coffee Cameo” guide. Looking ahead, the company hopes to distribute the guide to tourists. “We have our business in the UK and Australia, so we are starting to build out our brand globally. It would be a fun piece of content distributed in coffee shops in London, and if they come to Los Angeles they could do this coffee tour,” Siler said. “We are thinking about our brand in a global context and what we can provide people that is really interesting and unique about Los Angeles culture." Califia Farms plans to publish print editions of the magazine twice a year and will distribute copies of Pour Over for free at coffeehouses throughout the year. The next issue is scheduled for release in July. “Our first issue has a lot of content about hot coffee in it. The July issue will have more of a cold brew focus,” Siler said. Pour Over is distributed at places that sell and use Califia Farms’ Barista Blend almond milk, and specialty hotels, such as Ace Hotel.